Radish – Cherry Belle is a variety which produces top quality delicious radishes with bright red skin. Suitable for growing outside as well as for early production in a tunnel or greenhouse. Very reliable. Thin to 3cm between plants. 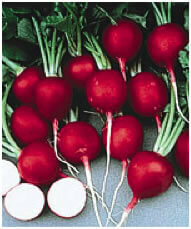 Radishes are an excellent and very fast growing, crunchy small root vegetable. They are perfect for a quick snack. Try cutting them in half and eat with a pinch of salt and butter. They are really quite delicious. Radishes grown with protection are even more tender and delicious. Radishes will grow in almost any reasonably fertile soil as long as there is plenty of moisture in the soil. They do require a place in full sun. The ideal pH ranges from 6 to 6.5. Radishes are one of the fastest vegetables to mature. You can harvest the roots from about 4 to 6 weeks after sowing. The only drawback is that once they are ready they will either become woody or go to seed. So you should only sow small quantities every now and then. Radishes are fairly hardy vegetables, so they can be sown in the tunnel or greenhouse from early February until early April every two weeks. The sowings from mid April until July can be made outdoors. Later sowings from late July until September can be made indoors again. Seeds can be sown directly into the ground. 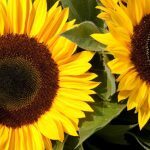 They should be sown very thinly (about 2.5cm apart) in rows 15cm apart and about 1.5cm deep. Radish seeds are quite big so they can be spaced out accurately. As soon as they have all germinated you can start thinning them. For successional cropping you should sow small quantities every fortnight. It is important to keep radishes in the brassica section of your rotation to prevent a build up of the numerous brassica pests and diseases. Don’t be tempted to intercrop them with other vegetables. There is no maintenance required, apart from thinning and keeping the plot weed free. Radishes are ready four to six weeks after sowing. They have to be harvested straight away otherwise they will become woody and very hot flavoured. The main pest of radishes is the fleabeetle. The symptoms are small ‘shot-holes’ through the leaves. A heavy infestation can destroy the crop. Covering the bed with bio-net or fleece straight after sowing may prevent the attack. 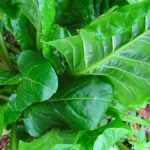 They may also suffer from all the other brassica pests and diseases but the fact that they are harvested so quickly, these problems rarely occur. You will get about 100 radishes in one square metre. This shows that you should sow little and often and never one square metre at one go.